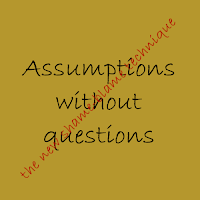 I hoped I would not hear this term again from anyone for the rest of my life: "assumptions without questions." The first time a woman used that as a indirect way to claim she was the victim of misunderstanding (and that I did not even care to understand) was the same woman who not only did not recognize that her son stalking my daughter as wrong because he was "in love" at fourteen years old, but also she was encouraging him. This incident caused my daughter to deal with anxiety over being stalked for nearly two years and she still worries about it with any guy she has met. Whatever assumptions this woman thought I had she proved with her actions were quite on target. The second time was recently and I have to say, the circumstances were very different, but the intention was the same. 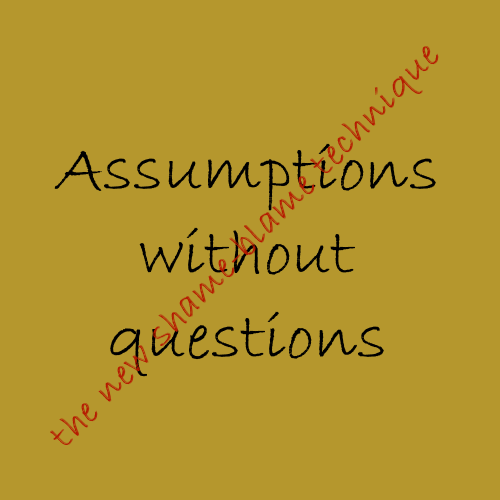 Using the term "assumptions without questions" is an accusation in an attempt to deflect any shame-blame on the person who has caused the misunderstanding and tries to place it on the persons who misunderstood. Personally, if someone misunderstands me, I apologize...even if I think I was clear enough. That is because I do not think everyone else is in the same frame of mind that I am when I say or write something. As a writer, I try to draw in my reader to see my perspective, because I know they are not coming from the same perspective, however there are times I fail to do that well or a person just is not seeing it the same way as I am. Case in point, a Facebook friend who has rabbits wrote something quite simple that everyone else seemed to get as I read through the comments, but my first impression was slightly different because I was thinking of his rabbits. His first two lines were: "Doe down! Bear chased all the bucks away." I immediately thought the worse for his rabbits, but the rest just did not quite fit my understanding of the first two lines: "Now to go get her. Thank you lord for this harvest!!!!" I was thinking what would possibly be left of the doe get if bears attacked his rabbitry and he should be looking for the bucks that had ran away. However, it all makes more sense if one is thinking the man was hunting deer. Did I make an assumption or did he leave out information because he assumed that everyone was on the same page with him thinking he would be hunting? Most truthful answer is both are correct. This was not that incident; that is just an example. The incident happened over the word "program," more specifically "reporting program." This suggested to the rest of us who were not thinking on the same thing as she was and reading what she had written, that the entire system of reporting the statistics was a failure and that reporting system is managed by specific people. This person is rather smart with a degree in science, so she should be capable of describing things well enough that it does not cause confusion. Therefore, when she said she had no trust in "the program", it sounded like she did not trust the people reporting the statistics, on which I commented. Next thing, I knew I was accused of making assumptions without asking questions. Of course, she believes it takes all the attention off her own assumption that anyone else would have obviously known she was actually talking about a computer program even though it was not obvious to anyone else reading it. "Program" is not a term exclusive to computers. It is not the misunderstanding with which I have a problem. Misunderstandings happen. It is how people handle it that shows their character. While using "assumptions without questions" seems to make the accuser blameless in his or her own eyes, it tends to make me focus on the accuser's issues of being self-righteous. If fact, I tend to feel set up so that the opportunity to make the accusation of making assumptions without questions is ever present and it just is with some people, sadly. I can admit that I am still quite raw from the first experience with the term and it may be a hot button for me, but if I had not fallen into the pit this last time, someone else likely would have and I would have been far more confrontational. However, I chose to ignore the insults and simply thanked her for clarifying so that everyone understood what she really meant. Did she intentionally set it up? No, but she did intentionally take advantage of the situation to try to make me look bad...this is not the first time she has told me how wrong I am, yet she lets others off who would make the same references. There is always things and people to pray about...one more of each on my list. My Lord, help me to be forgiving of people who try to shame-blame me. I wish to pray for them to be able to see people from a different perspective and consider that they themselves are not without blame when it comes to making assumptions.